Otto-031 was a SPARTAN-II supersoldier of the UNSC Naval Special Warfare Command, attached to the Office of Naval Intelligence. He serves with Team Black as a heavy weapons specialist, and is designated as Black-Three. He is visually distinguished with the Roman numeral "III" on his visor. Otto was abducted and conscripted into the SPARTAN-II program by Dr. Catherine Halsey in 2517 when he was six years old. He was then taken to the planet Reach, and trained by the AI Déjà and Chief Petty Officer Mendez, along with the rest of the Spartan children. He was assigned to Team Black, and trained with the other teams such as the Red Team. During so, he had an unauthorized relationship with Margaret-053 (Black-One). They were ratted out by Victor-101 (Black-Four), however, and put into the brig by Chief Mendez. Immediately following their release, a skirmish occurred, involving Margaret, Otto, and a few rowdy members of Red Team, which was set off by Otto's love affair with Margaret, which was debated as "non-Spartan behavior". In 2525, he and the other candidates underwent a series of augmentations to improve their abilities. Black-Three was among the ones that survived and were not crippled or killed by the procedure. Roma rescuing Otto from a Yanme'e swarm. During the Human-Covenant War, Team Black participated in numerous operations against the Covenant, including one where they destroyed a Covenant citadel and another in which they boarded a Covenant cruiser using C-12 shaped charges. In mid-2552, they were sent to destroy a Covenant Beacon on the Covenant-occupied UNSC colony of Verge. After landing on the planet, the team made their way past fortified anti-aircraft emplacements to the city of Ciudad de Arias where the Beacon was located, with Three hefting a case containing the team's ordnance and supplies. Once in the city, they took position in one of the skyscrapers to assess the Beacon's defenses. After the team observed a large swarm of Yanme'e, Kig-Yar guards and some Mgalekgolo, Roma-143 (Black-Two) found an injured, apparently non-hostile Yanme'e. The Drone, nicknamed "Hopalong", told them of an alternate, secret route to the Beacon. While the rest of the team were suspicious, they decided to trust the Yanme'e. In the next morning, the team proceeded to move to the Beacon through the tunnels. Equipped with C-12 "blow packs", they went separate ways and planted the explosives on each of the Beacon's four anti-gravity pylons. After planting the charges, they were engaged by the Covenant. Meanwhile, Hopalong had acquired a Covenant device and used it to free the rest of the Yanme'e. It was then revealed that the Spartans had been tricked: the Yanme'e, who now begun attacking the Spartans and the Covenant alike, were actually "Unmutuals", prisoners incapable of socializing with their kind. Three was attacked by several Yanme'e and lifted in the air by their antigravity grapplers, and while he managed to kill them, he was dropped from a great height and broke his ankle when he landed on the roof of a skyscraper. While One had ordered the rest of the team to evacuate through a train, Black-Two went to get Three. She managed to find him and the two escaped, with Two carrying Three over her shoulder, chased by a massive swarm of Drones. While on their way to the train, Two also detonated the charges on the Beacon, destroying it. Three and Two got onboard the train, headed to a Pelican dropship for exfiltration, escaping as the tunnels caved in under the collapsing Beacon. Otto is attacked by Thon 'Talamee. Some time later, the team was assigned to a covert mission onboard the ONI vessel Long Time Coming. However, the ship crashed on an uncharted moon, and One, Three and Four moved out of the wreckage toward a structure with breathable air and were soon engaged by Covenant forces. 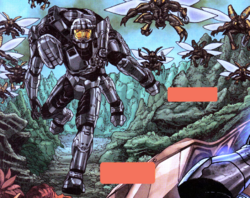 When Black-One was captured by mechanical Gatherers, Black-Three and Four reluctantly allied with the Covenant forces also on the moon in order to rescue their captured comrades. However, the Forerunner Monitor of the Installation, 686 Ebullient Prism, hacked into Victor's MJOLNIR HUD, tricking him into attacking his allies, wounding Black-Two and nearly killing Black-Three, having been reminded of the incident in training. It took Three and Iona to remind him of the importance of his adopted family, snapping him out of his tantrum. Team Black then went to assist One against Prism in the facility's control center. Black-One eventually destroyed the Monitor with the facility's main gun, simultaneously bringing an entire Covenant fleet crashing down. Team Black then went out to fight the Covenant survivors so as to commandeer a functional Slipspace drive to escape the moon. They succeeded in doing so and eventually reestablished contact with the rest of the UNSC. Black Team on Installation 03. By late July 2557, Otto and the rest of Black Team had been assigned to provide security for a UNSC science camp on Installation 03. On July 25, shortly after losing contact with the nearby Ivanoff Station, Spartan Black observed numerous objects exiting slipspace and falling from the sky. The Spartans moved to investigate one of the objects, which had landed nearby. At the impact site, they discovered an unconscious Ur-Didact, who had been knocked into a slipspace rupture by John-117 during the New Phoenix Incident. Unaware of who the Didact was, Team Black speculated the arriving objects to be an invasion force, though one member questioned the efficacy of the invaders given the Didact's seemingly inert state. 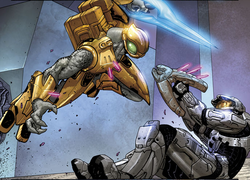 Suddenly, the Didact awoke, declared the Spartans' presence unacceptable and brutally killed Otto and the rest of Black Team along with the nearby scientists. During his rampage, the Didact decapitated either Black-Three or Four. A day later, Blue Team arrived at the site of the massacre to investigate the disturbance and discovered the corpses of Otto and the others. They were attacked by Promethean machines shortly thereafter. Otto was bold, pragmatic and outspoken, and he seemed to genuinely enjoy fighting. He possessed a wisecracking sense of humor and frequently exchanged playful banter with his teammates. 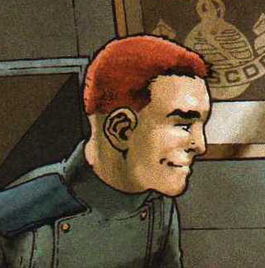 However, he was also rational and able to put his personal feelings aside and stay focused on the task at hand, unlike Black-Four, who, despite his calm façade, proved to be prone to emotional breakdown mid-mission. Despite their differences, Otto considered Victor his brother and would not harm him even when Victor was attacking him. Otto and the rest of Team Black training against Red Team with paint pellet guns. Black Team fighting in Line Installation 1-4's control center. Black-Three and -Four barely make it into the Forerunner facility. Black-Three firing at Sentinels with two M6 sidearms. Three fighting Victor in the Line Installation. Black Team discovering the unconscious Ur-Didact. Blue Team discovering Black Team's corpses. ↑ 5.0 5.1 Halo: Blood Line, "Issue 5"